With my boys at the ages of 11 and 9, I am realizing that the years of influence that I have with them in our home are coming to an end much sooner than I would like (sigh). This is not the introduction for a blog post of regret, but one of intentionality. For several years I have made it a discipline to write my wife at least 3 letters per year. This is a time to regularly reflect over our marriage, my level of engagement, and how the hopes-dreams-fears of life have changed over the last few months. Recently, wife said, “You should write the boys letters too.” She’s right. I guess I never realized they know how to read now. We have taken lots of trips together. If you look over the review of each trip, you will be able to tell I put thought into their spiritual and character development on each trip. But I realized I was counting on their memories to carry the content of those conversations into the future. Let’s be honest, kids remember events (i.e., flying on an air plane, riding down a water fall, rock climbing, etc…) more than conversations. Letters help compensate for that memory difference. I went and purchased nice 3-ring binders and sleeves for a letter notebook. I want the letters to last and for the notebook to feel special. On special occasions (i.e., our annual man trip, birthdays, challenging life event, or accomplishment like graduation) I will give them a letter. I’m not entirely sure about the frequency, but I want it to be two to four letters per year; enough time passing between that there are new things to comment on but frequent enough that they can be a running life commentary. Each time I give them a letter, at least until they move away (let’s not talk about that), I’ll read them the letter and allow it be part of a conversation; that way it doesn’t become impersonal. I’ve outlined a few content areas that I plan to write on in each letter. On the back of the letter, but no more than twice per year, I plan to print a “Tracing My Journey” chart I made which allows them to put their thoughts about life on paper. My hope for this is that they will be able to look back and see what was most important to them at different seasons of their life. It is an exercise in helping them live reflective, intentional lives. I don’t expect them to fill out every blank every time. Some of these questions require advanced reflection; like putting new foods on the table several times before kids will try them, I want to put these questions in front of my boys several times before they engage them. I expect that this tradition will morph and evolve with time. I share my thoughts about it at this incipient stage in order to encourage other parents to be intentional in how you communicate and preserve the important messages with your children. At the very least, I pray this will be something my boys take off the shelf when they should be studying (whether it is in high school or college) and review some of the fun memories we’ve had together. 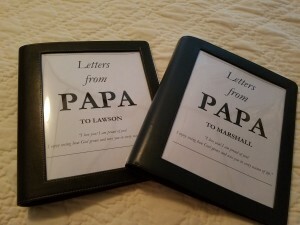 If I give them a sanctifying distraction from studying (which they’ll distract themselves anyway) that traces their journey and key messages from Papa, then the time spent writing a few letters each year will be well worth it.